'Darragh Hall', the Darragh A. Park estate designed by Peabody, Wilson & Brown c. 1920 in Old Brookville pictured last year. Click HERE and HERE for more on 'Darragh Hall'. Photo courtesy of James Hogarty. Except for those windows...the home looks basically untouched. Very nice. Also love the roof and chimneys. Looks as if the entrance porch has been closed in, but still nice. But I wonder how much of the original interior is intact. 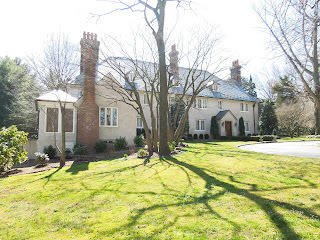 Off-topic; I see that old yellow colonial next to Old Westbury Gardens has been demolished. The house was in fine condition, so why would someone purchase the home just to tear it down? I haven't been home in a while but are you f*****g kidding me? I loved that house growing up. That's devastating...it had to have been 200 years old. How and why would this happen? There are probably 50 houses for sale in Old Westbury plus another 20-30 lots that you could build upon for sale. So instead someone tears down a 200 year old house? Old Westbury is lost. Sorry Zach...just past today,I'm sad to say that fine olde home is now rubble. Pisses me off to no-end. Old Westbury is lost indeed. The Levy place down the road is on the market. 2013 is less than three weeks old and we already have a winner for biggest scumbag of the year award. Who are these people that move to Old Westbury simply to destroy American history? Where are the pitchforks and torches to run them out of town? Old Westbury really has become a lost cause. Incredibly depressing. Past!!! I meant passed. Must have been a freudian slip, because while I was writing that, I was thinking how fast Old Westbury's grand history is falling to the wrecking-ball. I was at a lecture at the College of the Atlantic the other day, regarding preservation of an historic house on Campus. Next to me were a nice couple from England, where preservation and respect for fine buildings is in the DNA, asking why buildings weren't listed or protected here. Lastly, one of the enemies of old houses is the replacement window industry, which has falsely convinced people to throw away old windows that are often better made, and more energy efficient in combination with storsm---AND often cheaper to repair than replace. The Darragh Park house windows are an eloquent plea for at least better choices. I would love,love, to know the provenance on the yellow house.R.I.P...So it could be smeared in the faces of the powers that be, in Old Westbury. Without doubt , there was a valuable historic connection with that house in relation to VOW..its been a long time , but I remember that big, old, typic Long Island style home, fondly too.That house truly was regional style architecture. What a travesty. I remember an incredble wisteria arbor to the side? could that be right? Anyway, I am glad I have my memories ..What can we do..what can I do to stop the insanity? My mom shopped at Bohacks and Clyde Jr's and I got my first shoes at Stride rite..I prefer to rember that era. so sad. Thank you for reminding me of Bohacks, we had one in Locust Valley while I was growing up - the unforgettable meat department smelled distinctly of saw dust. Funny how these odd things and associations are imprinted on our brains. I have been bemoaning the poorly planned over development on the north shore since I left for college in 1974. Most days that doesn't seem all that long ago......but 39 years is more than "just yesterday" by any measure. Time flies! Very, very sad. I didn't know of the place until it was gone, but I looked at the real estate photos just now. Why wasn't it landmarked? Where are the historians? Who's the jerk who committed this atrocity? Was its location that important?